Bluefish, mackerel, whiting, jacks , and of course pompano have been on everyone's catch list. 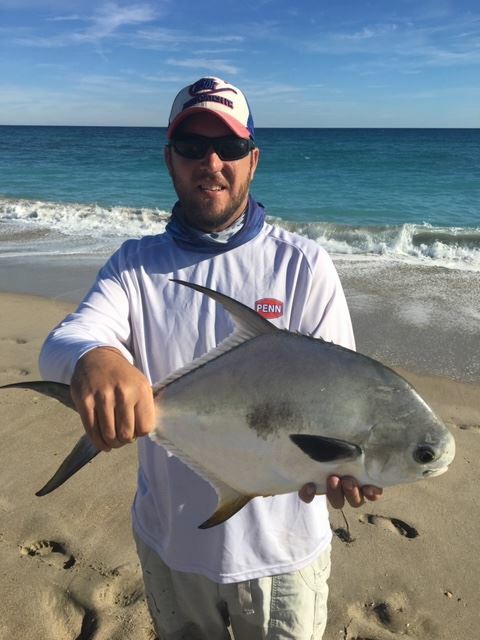 The pompano fishing on the weekend was hit and miss on Hutchinson Island,but it seems a new body of fish have moved into our area. I fished on Saturday and Sunday at a couple of beaches near Fort Pierce Inlet and only managed to catch a handful of keeper pompano. Today was a different story. My son Randy and I started up that way but ended up moving just South of Herman's Bay beach access and were able to put together a big catch. The highlight of the day was Randy catching and releasing a nice permit on a EZ Flea Fishbite. EZ Flea and Pink Shrimp were the two scents that were hot today. We also caught some nice pompano on frozen sand fleas that were tipped with a small piece of Fishbite. By putting a 1/2 inch piece on the hook after securing the sand flea will not only help the sand flea stay on when you cast, it will keep you in the game in the event that a crab or small fish nips the bait off of your hook. I talked to friends who fished at Normandy, Tiger Shores, and Hobe Sound beach accesses over the weekend and they all had one fish in common - bluefish. Spoons and cut bait worked equally as well and they bit all day. I have to highlight the importance of reaching the pompano if that is your targeted species. Anglers that were fishing right along side of us today kept coming over and asking what we were using for bait. I did explain to the folks that the bait wasn't the problem, they were just not reaching the area of the trough where these fish were stacked up. Long rods and LongCast spinning reels or conventional casting setups are what's needed to get the job done. Good luck this week and catch em up.